Brenda is a certified Forensic Healer and Holistic Life Coach who seamlessly combines intuitive and analytical gifts to offer women unique healing sessions. Forensic Healing™ is a new holistic healing system that can be used to address any pain, stress, or discomfort. It is based on the premise that when you fully identify the root cause of a condition in the body’s energy field, it will be released from the body. Brenda also has a gift for being able to connect with your life energy through psychic visions and messages she receives. This combination provides you with a powerful healing experience. 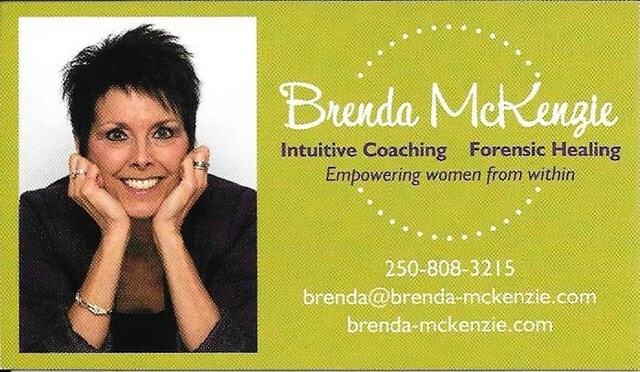 Brenda will be offering FREE READINGS of your Negative Life Patterns and BREAK FREE Rapid Change Sessions at the Kelowna Wellness Fair. Come meet her and learn more!